Hockey has had its share of bizarre tales over the years, but none compares to the fascinating story of the California Golden Seals, a team that remains the benchmark for how not to run a sports franchise. From 1967 to 1978, a revolving door of players, apathetic owners, and ridiculous marketing decisions turned the Seals, originally based in Oakland, into hockey’s traveling circus. The team lost tons of money and games, cheated death more often than Evel Knievel, and left behind a long trail of broken dreams. Live seals were used as mascots, players wore skates that were painted white on an almost-daily basis, and draft picks were dealt away nonchalantly like cards at a poker game. One general manager was hauled in for questioning by mysterious men because he’d mismanaged a player contract, while one of the team’s goaltenders regularly spat tobacco juice at the feet of referees. The California Golden Seals examines the franchise’s entire mismanaged—but always interesting—history, from its ballyhooed beginnings as a minor-league champion in the 1960s to its steep slide into oblivion in the late 1970s after moving to Cleveland. 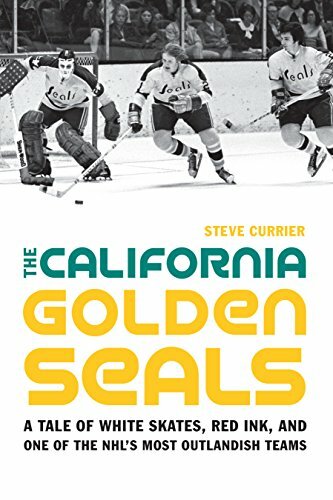 Through a comprehensive season-by-season narrative and a section of definitive statistics, Currier brings to life the Seals’ entire history with lighthearted anecdotes, personal interviews, and statistics about hockey’s most infamous losing team.